Last month Giacobbe “Jake” Lamotta, known both as the “Raging Bull and the “Bronx Bull” passed away in florida at the age of 95, decades after of his opponents took the final ten count. Lamotta was born on the Lower East Side of Manhattan New York on 10 July 1921 to Italian Immigrants. It was a tough neighborhood, in fact he was in the same street gang as Rocky Graziano. How would you like to run into both of them in an alley in the middle of the night? The only way out of the slums for Jake was with his fists. He turned professional on March 3rd 1941 and defeated a guy named Charley Mackley, and within a year was matched with “Sugar” Ray Robinson and lost a competitive decision. Some background on Robinson is necessary here.Robinson was just 22 when they fought, however he had been 85-0 as an amateur with 69 knockouts, forty of those in the 1st round, he then turned professional and was 35-0 (27 knockouts) when he fough Lamotta in the first of what would be a six fights. Lamotta and Robinson set the standard for ring rivalries. Lamotta won the second one, knocking Robinson out of the ring in the process. There is a photo of that on the homepage of this website. In those six fights Lamotta put Robinson down three times, while Ray was not able to put Jake down, even in the famous St. Valentine’s Day Massacre fight on 14 February 19, which by the was the site of for the original massacre. Ray won five of the six, but that is misleading. You see the money was on Ray, not jake and the series could have easily been Lamotta five Robinson one, rather than the other way around. Lamotta rampaged through the Middleweight and light heavyweight ranks unable to get a shot at the title for years, even though he beat great fighters like, Robinson, Fritzie Zivic, Jose Basora,George Costner, Tommy Bell, Lloyd Marshall, Robert Villemain, Bob Satterfield and Holman Williams. Marshall and Williams were black fighters that many fighters avoided including Robinson. Jake fought them both and beat them. Finally Jake did get his shot for the title against the legendary Frenchman Marcel Cerdan in 1949. Unfortunately the only way Jake was given the opportunity was to agree to fix a fight.It didn’t matter that he had been a top contender for eight years, it was all about the money and protecting their own fighters. So Jake fought Billy Fox, a light heavyweight that had a knockout string that ran to 43. Jake was a great fighter but a lousy actor and everyone who witnessed it knew what they where watching. It is sad that Lamotta had to do that however, if he hadn’t he never would have won the title and he would have gone down in history as one of those “Uncrowned Champions” who were great fighters that just did not get the opportunity. on June 16th 1949 Lamotta, stalked and battered the Frenchman and it was mercifully stopped in the 10th round. Tragically before the re-match, Cerdan was killed in a plane crash in the Atlantic Ocean on the way to training camp.Lamotta went on to defended his title twice, including the Lamotta-Dauthuille fight, the 1950 Fight of the Year in which Lamotta won by knock-out in the 15th Round. Lamotta lost his title to who else – Ray Robinson. 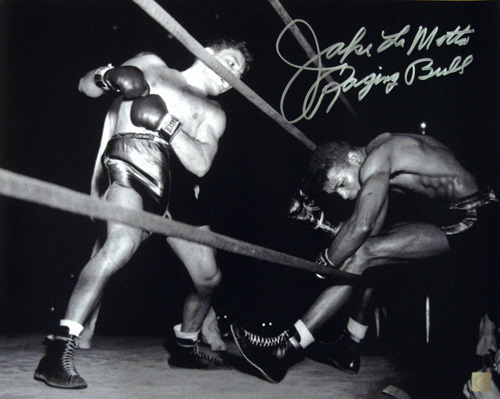 Jake fought on until `1955 and finished with 109 fights, 83 victories, 19 loses and four draws, including 30 knockouts. He fought the all and then some. He was very proud of the fact that he had never been knocked down, that is until until his 106th fight against Danny Nardico. The Academy Award Winning movie “The Raging Bull” won fellow Italian American Robert Deniro the best Actor Oscar in 1980, which was based on the best selling book that preceded the movie. Lamotta passed away quietly in a Hospice of pneumonia in Aventura, Florida on 19 September 2017 at the age of ninety-five, which was sixty-eight years after winning the MiddleWeight Championship of the World. Rest in Peace Jake, there will never be another one like you. It has been almost a week since the Golovkin Vs. Alvarez fight. I wanted to wait a while before addressing the result of the fight and for the to smoke clear a bit. Adelaide Byrd’s score was 118-110. Many had that score, only it was for Golovkin not Canelo. The world was watching and it was an excellent fight, only to be ruined by Ms. Byrd. Another black eye for boxing, and at the worst time possible as well. When will it end? My only question is this; is Judge Byrd corrupt or is she incompetent? The boxing commission and those in power seem to have convinced themselves that she just needs training. Training? She has judged 492 fights. If I do anything 492 times, I would be an expert. What’s her problem? Adelaide Byrd is both corrupt and incompetent. Why corrupt? Because she usually is for the house fighter, the sentimental favorite or is personally biased. In the fight in question, she was for the Cash Cow – Canelo. A Judge is supposed to be impartial. Nonito Donaire, a former world champion, said she is ruining the game. He has point, but she isn’t doing it alone. The selection of judges is driven by State Commissions and influenced by the top promoters. The solution is a National Boxing Commission. The establishment of a National Boxing Commission, would be a giant step forward for boxing. And is long overdue. Back to Adelaide Byrd. She just needs to go away. I for one, and many agree, is that she should be nominated for the Boxing Hall of Shame and retire. She is not a good judge nor does she have the necessary skill set and is easily influenced – and for all the wrong reasons. Please go away Ms. Byrd, before you do any more damage, and find another line work. It is just after Midnight and I just watched the much anticipated show-down between Gennady Golovkin and Saul “Canelo” Alvarez. Similar to the Original Golden Boy, Canelo can not win the big one. Everyone I watched the fight with had Golovkin winning 9 or 10 rounds. GGG stalked and effectively pressured throughout and landed the harder blows. , Canelo had has moments but that’s all. He did try to come on late, but it was too little and too late. One Judge had it a ridiculous 118-110, another had it 116-112 Golovkin and the third had it 114-114 – a draw. The draw was off as well, but dimmed in comparison to the 118-110 score-card. The commentators were very biased for most of the the bout, favoring Canelo. That is until even they had to accept what they were witnessing. The crowd initially were for Canelo, but these are people who know boxing, and when scores the were announced, booed mightly, as they did when Canelo was interviewed. They cheered the real winner Golovkin when he was interviewed. The men’s faces told the story. Golovkin was calm, confident and had the look of a winner, Canelo looked very much like a loser. He knew he did not deliver, and he winced when own fans booed him. Well, that’s boxing. There will be a re-match, and we will all watch again. Why? Because no sport has what boxing has and love her or hate her, we keep coming back. The big fight is almost here. Not the glorified sparring session we saw last Saturday. It is a real show down against two of the best in boxing today. Gennady Golovkin and Saul (Canelo) Alvarez are both in their prime and have a combined 86-1-1 record with 67 knock outs. It doesn’t get too much better than that, and it’s on Mexican Independence day at that. Gennady G. Golovkin, the 35 year old bomber from Kazakhstan had a 345-5 amateur record and is 37-0 with 33 knockouts as a professional. He is the WBA (Super), WBC, IBF and WBO Middleweight Champion of the World. His record includes a string of 23 consecutive knock-outs. He has defended the Middleweight title 18 times, just two behind the record set by Bernard Hopkins. Saul “Canelo” Alvarez is 27 years old, was born in Guadalajara, Mexico and has a 49-1-1 record with 34 knockouts as a professional. Like most Mexican boxers he had very little amateur experience which is understandable since he turned pro at the age of 15. Canelo has also won multiple titles, is the “Ring” Middleweight Champion, is the new Golden Boy and a boxing hero in Mexico and with Hispanics. Canelo is a boxer-puncher and natural counter puncher and is at his best when his opponent is coming at him – which GGG will do. Both fighters have excellent resumes, Golovkin has fought and beaten; Daniel Jacobs, Kell Brook, David Lemieux, Willie Monroe Jr., Curtis Stevens, Gabriel Rosado, Martin Murray, Daniel Geale and Matthew Macklin. Canelo’s only loss was to Floyd Mayweather Jr. four years ago, and has beaten among others; Julio Ceaesar Chavez Jr., Liam Smith, Miguel Cotto, James Kirkland, Erislandy Lara, Alfredo “El Perro” Angulo, Shane Mosley, Carlos Baldomir and Josesito Lopez. Surprisingly they do not have any common opponents. Both have excellent cornermen. The fight will be in Las Vegas, on Saturday 16 September, at the T-Mobile arena and has a good card including Jojo Diaz (24-0) vs. Jorge Lara (29-0-2), Lightweights and Randy Caballero (24-0) vs. Diego De La Hoya (19-0) Bantamweights. Two good fights between young undefeated fighters. Diego by the way is Oscar De La Hoya’s cousin. The card is being promoted jointly by Golden Boy Productions and K2 Promotions, the Klitschko Brothers promotion company and will be on HBO PPV. This is a 50-50 fight for most people. I like Golovkin because I think he has more power and is a better boxer than given credit for. You don’t knock out 23 consecutive opponents on power alone. Also Golovkin has been fighting his entire career at middleweight, while this will be only the second time Canelo comes into the ring at 160 or more. My final thought is that Canelo has been moved carefully, in order to make him look good and build his confidence. He also usually fights smaller men or as in the case of the Chavez fight, had his opponent come down in weight to meet him at a catchweight (164). Like I said, I like Golovkin in this one. We’ll see. It should be a Classic, with the pressure fighter against the counter puncher. Enjoy the fight.